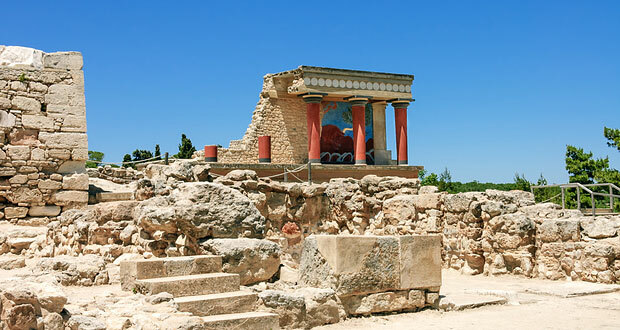 The Minoan palace in Knossos is the biggest attraction in Crete. It is located on the Kephala Hill approx. 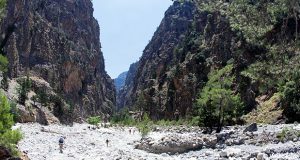 5-6 km south of Heraklion. The surrounding landscape is filled with olive groves and vineyards. During the Bronze Age, Knossos was the most impressive and luxurious building in Europe and the largest of the four Minoan palaces in Crete. All the palaces in Crete are very characteristic with their palace yards, temples and large storage rooms. Excavations prove that the area was populated as early as 6,000 BC. After several hundred years of hard work, the palace was finally completed in approx. 2,000 BC. After a heavy earthquake in approx. 1,700 BC, the palace was reconstructed and it is the ruins of the reconstructed palace, which the visitors can see today. With its approx. 1,400 rooms, the palace was quite impressive. Surrounding the palace yard were the two main buildings: the more official west wing and the private east wing with living and working quarters. The west wing was mainly a large administration building. But it was also the location of the storage corridor, where there was a large number of jars with oil, grain, dried fish, beans and olives. The jars, which were up to two metres high, can still be seen in the palace. The west wing did also house the treasury. In the east wing, the king and queen had their chambers, and the many decorations include a fresco with blue dolphins. The queen’s bathroom had a bath tub and maybe the world’s first water flushing toilet! Many of the attractions are reconstructed, e.g. by the British archaeologist Sir Arthur Evans, including the many impressive pillars and frescos. However, this only serves to make the experience even better.